Ragusa Ibla combines magnificent architecture, celebrity glitter, and the delights of a small Italian town. From afar, you see the limestone houses perched on a hill covered in carob, almond and olive trees. A deep valley surrounds the hill and drops into a water-filled ravine. A natural fortification that nevertheless, over 2000 years, failed to stop invasions from the Greeks, Romans, Normans, Byzantines, Moors, Spaniards, French and Turks. The houses of Ragusa, each adjoining its neighbour, are hewn into the side of the hill and follow its slope. Inside the town, you stroll down narrow, winding lanes past beautiful palazzi, churches and houses. The streets are so narrow, that you can stand in the middle of the street, stretch out your arms and almost touch the houses on either side of the road. When I locked the front door of my room I had to flatten myself against the building otherwise I would have been in the path of cars. Only permit holders can drive into the town. Residents need to lower rubbish in a plastic bag at the end of a string down to ground level where a small garbage van collects it. From the outside the houses look small, but inside, the rooms are often surprising spacious – white-washed walls with wood-beamed ceilings, some with stone arches. It was lovely to sit on the balcony of my hotel room with a sandwich of locally produced cheese, a glass of wine from the region, and gaze over the green hills. Sheep, goats and cows graze on very fertile land here and the local produce of cheese, wine and cured meats is prized. 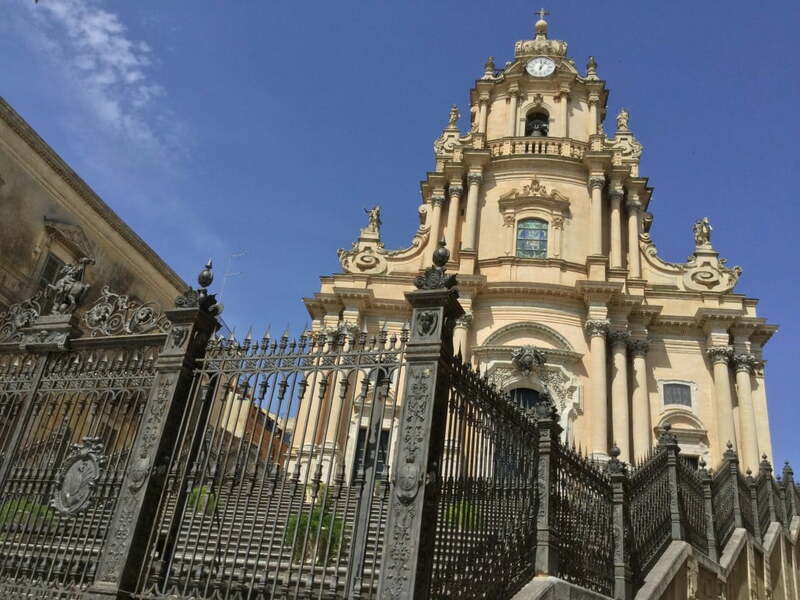 Ragusa Ibla is one of 8 towns in the southeast part of Sicily that are listed as UNESCO World Heritage Sites. This is because they are the only places in Italy with so many buildings in what has been called the Sicilian Baroque style of architecture. It is a style that grew out of a catastrophe. In 1693, the area was devastated by a massive earthquake which destroyed Ragusa and killed 5,000 inhabitants, as well as destroying other towns in the region. After the destruction, the impoverished people of Ragusa decided to rebuild the city on a higher plateau, and thereby founded the more modern, upper town called Ragusa Superiore. The Ragusa aristocracy however, decided to rebuild their palazzi, churches and gardens on the ruins of old Ragusa. They were well served by a great architect, Rosario Gagliardi, who developed this Sicilian Baroque style which can be found most notably in the towns of Ragusa, Noto, Modica and Scicli. An outstanding example of this style is the Cathedral of San Giorgio. It is the focal point of Ragusa Ibla and contains some of its best art works. In additions to religious services, it hosts many concerts. On the day of the patron saint of Ragusa, the huge statue of St. George on a white horse is taken from inside the Cathedral and carried by teams of young men through the decorated streets of the town. Hundreds of people from all over Italy join in the procession which culminates in a fireworks display that lights up the Cathedral. The Cathedral of San Giorgio sits at the top of the town centre – the Piazza Duomo. And it is here, that you can sit and eat delicious gelato made from surprising ingredients such as carob, olive oil, or chilli peppers, and flavoured with wine. Gelati DiVini make their own gelato and offer different flavours each day. Follow this with an espresso. This Piazza is the focal point of the passeggiata around the streets of the town. When walking from the Piazza Duomo alongside the Cathedral – look up. You will see beautiful ironwork balconies supported by the most extraordinary limestone gargoyles. These gargoyles are UNESCO-listed and made from local limestone that has been naturally impregnated with underground oil reserves, making it both amenable to sculpting and durable. Ragusa Ibla has unexpectedly become a desirable tourist destination for a singular reason. Inspector Montalbano is the name of a remarkably popular Italian TV series, based on a series of novels by Italian author Andrea Camilleri. Filmed principally in Ragusa Ibla, the series has been a hit in over 40 countries and exposed people to the beauty of Ragusa, as well as the attractive looks of Luca Zingaretti, the highly regarded Italian actor who plays Montalbano. The popularity of the series has produced the phenomenon of Montalbano tours to Ragusa where tourists visit sites that appear in the series. Montalbano’s beachfront house and the expanse of beach onto which his balcony opens have become a place of pilgrimage. Fiction rarely accords with reality, and this is especially so here because the site filmed as Montalbano’s ‘home’ is in Punta Secca and his ‘beach’ that seems just beyond his balcony, is kilometres down the road, put together by the magic of the editing room. One of the truly spectacular Montalbano sites is the Castle of Donnafugata. In the series, it is the home of the Mafia boss, but in reality it is a very grand, very beautiful castle that sits on the highest part of Ragusa. This castle and the aristocratic family who owned it have an even earlier claim to fame. They were the inspiration for the acclaimed novel, The Leopard by Giuseppe Tomasi di Lampedusa. Baron Corrado Arezzo De Spucches, whose family owned the Castle of Donnafugata for hundreds of years, was a leader of the Sicilian aristocracy. With the unification of separate states into the new Kingdom of Italy in the 19th Century, the Baron and his class of ruling nobles lost much of their power. Hollywood made a film called The Leopard, based on the novel, starring Burt Lancaster as the Baron, with Alain Delon and Claudia Cardinale. Donnafugata Castle is open to the public, and although only 28 of its 122 rooms are open, they are fascinating. The gardens are gorgeous. You need to drive or get a taxi to Donnafugata as it is outside Ragusa Ibla. Donnafugata is about 16 km from Ragusa so it can be reached in about 20 minutes by car. There is also a local train Ragusa-Donnafugata, but it runs only twice a day. Another legacy of the nobility of Ragusa is to be found in the middle of the Piazza Duomo. It is the Circola Di Conversazione, established in the 1850’s as a club for men. It is still a bastion of local power and influence with exclusive membership and no women allowed until 1973. My guide, Nunzia Leonardi, a woman who had lived in the area her whole life, had never before been able to set foot inside this club. Remarkably, and with great courtesy, they responded to her request to let me, an Australian journalist, come in and photograph the plush red velvet sofas and drapes, the intricately designed ceilings and chandeliers, and the gorgeous terrazzo floor. One of the loveliest places to escape the hot Sicilian sun is in the gardens of Ragusa. The aristocrats of Ragusa built these gardens at the end of Ibla’s rocky ridge, initially as their own private gardens. But now they are a public gardens with views overlooking the valley. Ragusa is a town that charms you with its intimate size, its quieter pace, and above all, with its beauty. There are many tours to Sicily and given the poor public transport there, a group tour is probably the most efficient way to cover a lot of territory. I did not know this before I went, so I travelled solo and still had a fabulous time. I felt safe wherever I went in Sicily and was treated with courtesy and helpfulness. If you do fly to Catania, there are no trains from Catania to Ragusa. You can take a bus which takes about an hour and a half or a taxi which takes just over an hour and cost around 120 Euro. There are different taxi companies that you can either pre-book or call once you get to Italy. I used Sicily Airport Transfers. In Ragusa, as in other Italian towns, I decided to hire a local qualified guide and I found that this was the best policy for touring the area, learning a great deal, and enjoying the company of a local. You can Google the various cities and find local accredited guides. The guide I found in Ragusa, Nunzia Leonardi was outstanding. She was a very knowledgeable about the area and its history, spoke excellent English, was most pleasant to spend time with and very accommodating in helping me explore the things in which I was most interested. I found the Hotel Dell’orologia in Ragusa through booking.com. It is one central hotel with rooms nearby in different streets. My room was lovely, with a private kitchen, and a beautiful view over the hills of Ragusa. The breakfasts were a delicious selection of freshly baked pastries, local cheese, omelettes and good coffee. The hotel was reasonably priced. Good food is one of the joys of going to Italy. You don’t have to go to restaurants to have sensational meals. In Ragusa as elsewhere, I just went into the local delicatessen and chose from the wide selection of cheese, sausage, and olives to go with a fresh roll. Trattoria La Bettola and Rusticana were two family restaurants that were enjoyable. The specialty of the region is anything to do with eggplant and in particular, eggplant caponata. When this sort of good unpretentious food is readily available, I would not waste time and money going to the Duomo – which has 2 Michelin stars. The lunch special I tried there was totally tasteless and the portions were tiny. You are better off crossing the piazza to the many local restaurants offering really good local food and large helpings that reflect their generosity and hospitality.